What’s scrapbooking digital style? It’s a fabulous NEW way to enjoy all the fun of traditional scrapbooking, PLUS you can have fun scrapbooking cheaper, faster, and more simply … with endless color options! When you get into scrapbooking digital style you can get your supplies online, anytime, day or night Just order, download and you have the files forever! Digital scrapbooking files come as JPEGS and PNGS (like you get with your digital camera). You can use them over and over, combine them in thousands of different ways, even shift the colors to EXACTLY what YOU want. You’ll never have to go back to the craft store or wait for the mail to come to enjoy your favorite hobby. To use digital scrapbooking files, you’ll need a photo editing program like Photoshop, PhotoShop Elements or PaintShop Pro. Or, if you want something free, you can use something called The Gimp, which does the same basic things, and move up later. JPEGS are usually full images (like papers and backgrounds) and PNGS are cut out objects on a clear background that you can layer together (like regular embellishments or frames). See the image below for a quick how-to using one of my packs as an example. 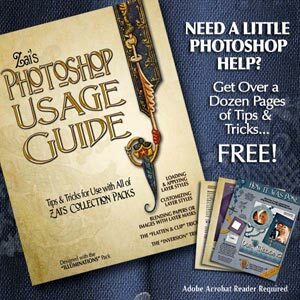 Within your favorite photo editing program you can easily shift the overall color, select only certain parts and change those colors, or build up a fancy design layer on layer and make things semi-transparent to do sophisticated overlays. You can also use seamless patterns, re-size things, flip things and even duplicate them without ever picking up a pair of scissors. You can adjust your photos, too! Photos that might have been discarded as regular prints can be saved AND you don’t have to pay and wait for prints, either! Even use the same photo multiple times without getting more prints. If you have touches of red-eye or a too-dark photo you can easily fix that. You can even colorize your photos, like the old-time sepia look or make them black and white for a studio look. Scrapbooking – A Whole New World of Fun! 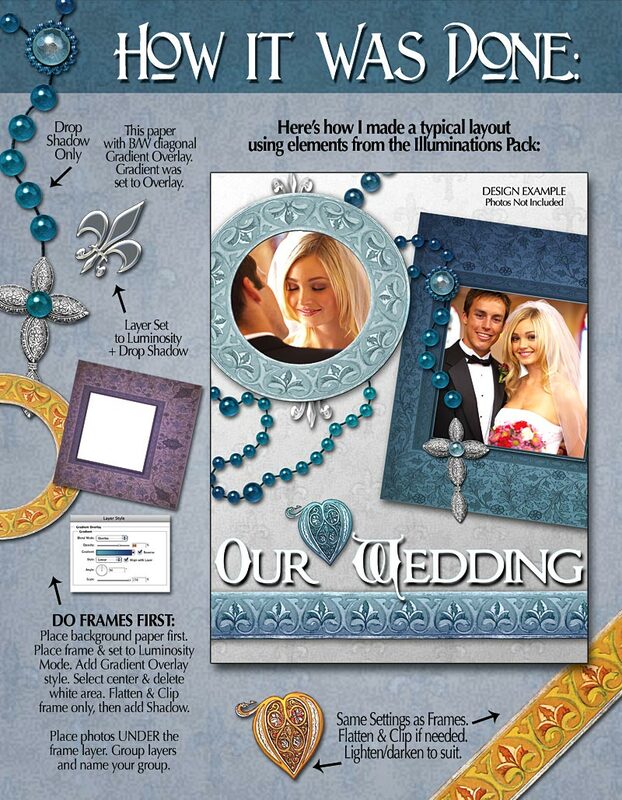 Scrapbooking digital style opens up a whole new world of scrapbooking fun. There’s no mess either! No storage issues, no tools to keep track of and no running out of your favorite material. And if the material doesn’t come in the color you like…change it! You make the rules! Best of all, scrapbooking digital style makes it easy to share your creations with your friends and family. Just save out a finished jpeg of your design and you can email it, upload it to your blog or FaceBook page, or have digital prints made to put in your traditional scrapbooks. It makes for great gifts, too. Create a customized version of your scrapbook designs for everyone with their name or initials on it and you have the perfect personalized gift for Christmas, birthdays, holidays, etc. 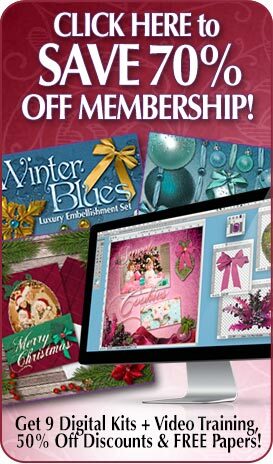 Scrapbooking has never been easier or more fun when you scrapbook digital style!